Liberty Gap Cover offers you two options to protect you and your family from financial burden by closing the gap between the amount your medical scheme covers and the costs many providers charge for in-hospital treatment. We also offer extended cover for unexpected dentistry and cancer-related costs. Liberty Universal Gap Cover offers the most comprehensive medical expense shortfall cover and additional financial protection for a wide range of health risks. Liberty Essential Gap Cover offers affordable medical expense shortfall cover for the most frequent shortfalls, and additional financial protection for selected health risks. You can enhance your Liberty Gap Cover by adding our Extended Cancer and or Extended Dentistry Cover. As a medical scheme member, you probably expect your full costs to be covered if you are ever hospitalised. Unfortunately, this is seldom the case. 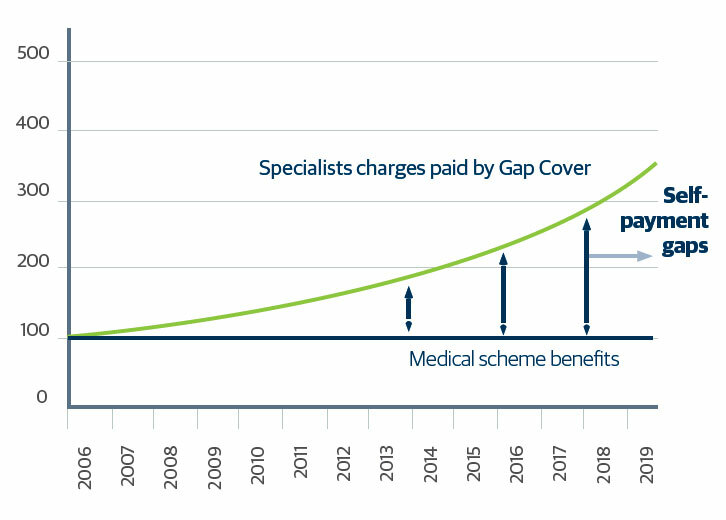 The graph below shows how the self-payment gap, faced by medical scheme members, has grown since 2006 and how this trend is expected to grow into the future. As medical scheme members, you and your employees probably expect your full costs to be covered if you are ever hospitalised. Unfortunately, this is seldom the case. Your employees can further enhance their cover by taking one or more of our optional Extended Dentistry and or Extended Cancer options. Liberty Universal Gap Cover offers comprehensive medical expense shortfall cover along with additional financial protection for a wide range of health risks. Liberty Essential Gap Cover offers affordable medical expense shortfall cover for the most frequent medical shortfalls, along with additional financial protection for selected health risks. We also offer your employees extra optional cover via our Extended Cancer and or Extended Dentistry Cover.